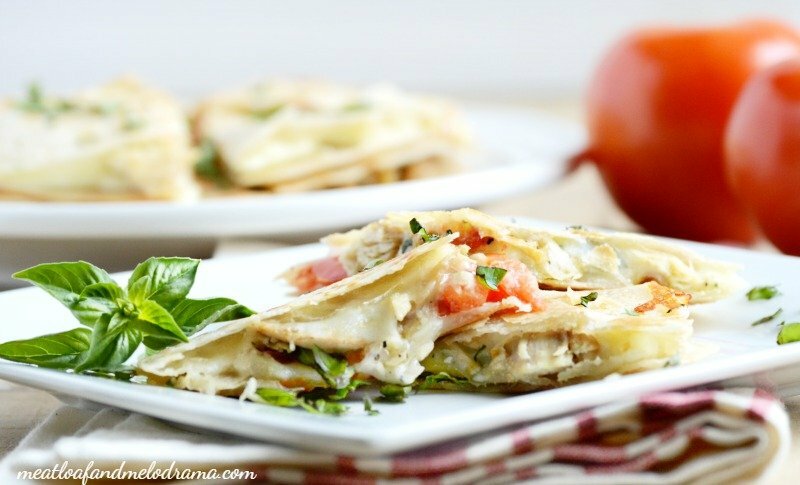 Mini Chicken Caprese Quesadillas are made with leftover chicken, tomatoes, mozzarella cheese and fresh basil for a fun twist on the classic salad. So, what do you do for dinner when you don’t have a lot of time or energy? Do you eat out, order in or try to scrape something together? I have to admit that I love going out or even having the Hubs bring home Chinese, but we can’t do that very often. And when life gets a little crazy, like it is right now, I just try to whip something up with whatever happens to be in the fridge. So, I’m a huge fan of using leftovers to make dinner. And by that I mean creating an entirely different meal the second time around — not just re-heating the food, although that definitely works in a pinch! 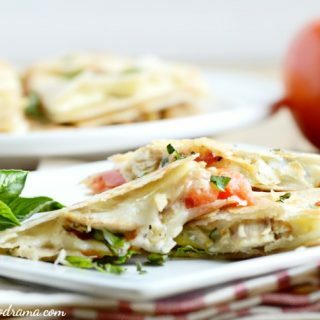 But this way, nobody can complain that it’s just leftovers, especially when you serve something as tasty as these mini Caprese Chicken Quesadillas. These are similar to Caprese salad, which I love, but the kids don’t. 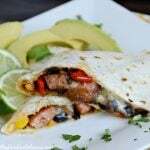 They do like just about anything wrapped in a tortilla, so they loved this version. I used small tortillas so that this would be even easier to eat, and I heated them on a griddle. Then, I just added the rest of the ingredients. Next, I just assembled the quesadillas, cut them up into small triangles, and that was that! The combo of fresh tomatoes, basil and mozzarella gives these little triangles the classic Caprese taste. 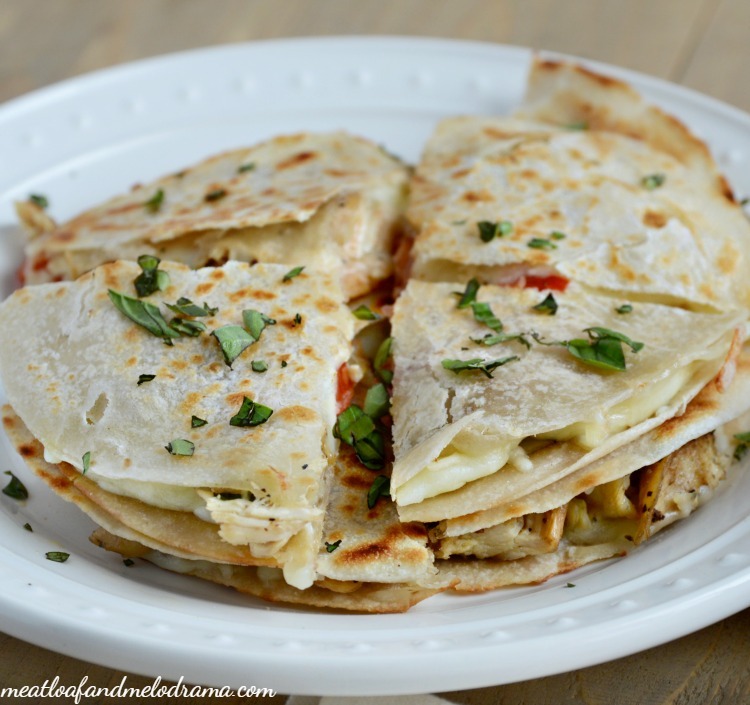 Plus, you get the melted cheese and crispy crunch of a quesadilla. And they’re good — very good! We almost always have leftover cooked chicken in the fridge, but you can always use rotisserie chicken if you don’t have any. And, if you wanna see why our life is a little crazy right now, you can hop on over to my Instagram page and check out our newest family member. She’s a real sweetie, but she needs a lot of attention right now, and so does her older fur sibling — He’s still not sold on the whole idea! Thanks! We really packed the cheese in that one! How adorable! You had me at Caprese, on my to make list they go, yum! What a great idea, I could go for a couple of these right now! I had the extras for lunch — They heat up well too! 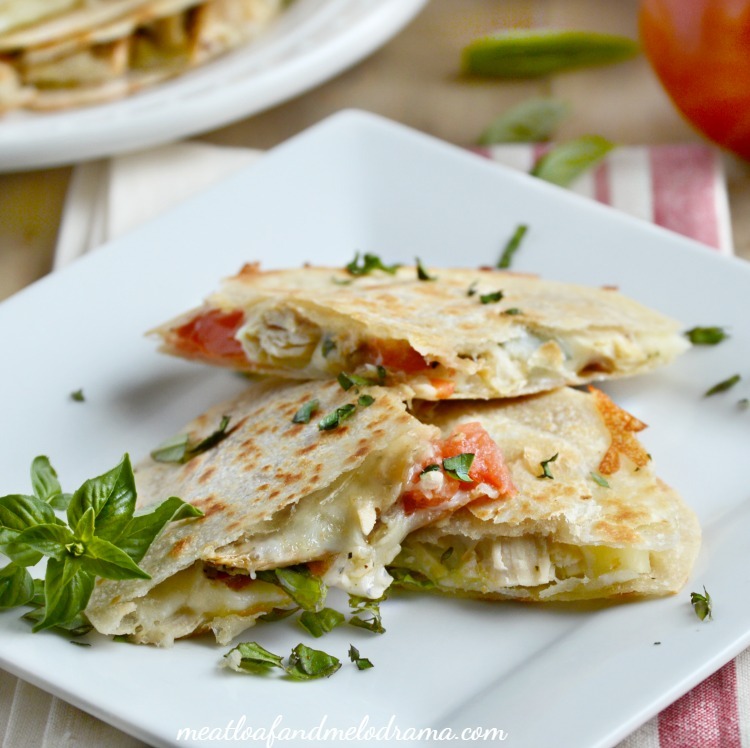 I love interesting quesadilla combinations, and caprese is one of my favorite flavor combos! We will be trying this! 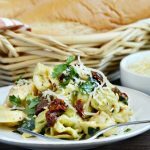 I always seem to have leftover chicken, which is great because you can do so much with it! Thanks for the inspiration! I completely agree — I love having leftover chicken on hand! I love that I’m seeing caprese being presented in so many new and creative ways! 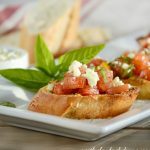 It’s always been one of my favorite appetizers and it’s only getting better! It’s one of my favorites too. I love tomato, basil and mozzarella on crackers, but this works out better for the kids. I love caprese anything! 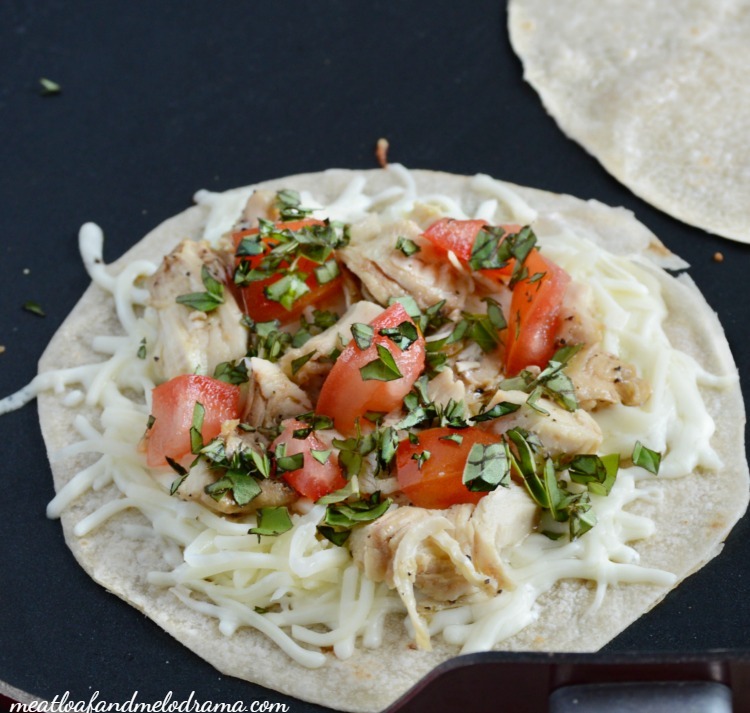 Fantastic idea to make a caprese quesadilla and add the extra protein! What a great idea , these look awesome! Thanks so much for sharing with us at Full Plate Thursday and have a fabulous weekend and come back soon!